This is a service from the Phibase, Raybot and Cabex guys. The sellers are available on the forum to answer questions and comments. Please use this topic to share your experiences of this service. Welcome to our forum, FSP. Please post some information about your service including any evidence of success such as real, live, accounts using myfxbook. so the numbers don't stack up at the current price. as you have to offer it at a price to make sense - as right now the customer is basically lending you 2000 or 4000 depending on the risk level just to break even ... at those type of prices they may as well just buy a full licence. here humble, not much history yet. Yes, I had noted this originally but I wanted the vendor to give his "perspective" and try to justify 13 days of trading as justification to trust this expensive service and justify what Donbon2, has pointed out. maybe they have the bugs worked out by now. Like all vendors that come to our humble forum, they deserve our benefit of a doubt; let's watch their live account for the next three months and listen to their justifications to our queries. Can the vendor confirm the pip value is the same for all trades all strategies otherwise the published results are meaningless? These guys are great marketers as with the release of their previous bots - of which the most widely used Cabex has been in gradual decline for the last year or so. You can't say that just because a bot produced a few thousand pips in the first 5 years that it will continue to do so, as they seem to confirm by adding index in 2018. The R:R is awful at 1000 pips DD to 200 average per month....you would need to be VERY patient with this one! yeah the risk/reward is out of whack from multiple perspectives. I advise you to stay away from these guys. They are good sellers, but they don’t understand what they do in market. 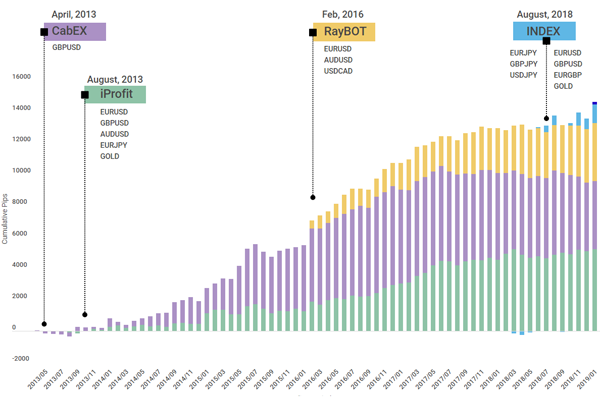 I remember when they released Raybot they promised 10 percent per month, but their robot was not working and did other deals for 2 years, they could not fix it, Cabex 2 years already in the red and every time they answer that everything is fine. They have very good support, they will always tell you that everything is good and that you are losing money is part of the strategy. Thank you Donna and HumbleTrader for introducing the topic. We have been on this forum since 2011 and have learned a lot from the discussions here. Senior members like Fmonera and EuroSmarter have been there to share their expertise when we needed it the most. We look forward to learning and improving our strategies from the discussions here. The following posts attempts to clarify upon the questions/opinions posted by members here. Since our posts are detailed, we avoid quoting the related posts fully and only refer to the member's screen name. ForexSignalPort clones trades from our master accounts - This EA by itself does not contain any trading strategy or cannot be backtested. We have provided the brief summary of each strategy and links to their live trading accounts. All the EAs are available as independent EAs with reliable interrupted live trading reference accounts provided by ForexGermany.de since 2013. The test accounts are run as using defaults settings at all times and no manual interference has ever been done. We take this opportunity to thank the admin of ForexGermany.de for the professionalism with which the tests are conducted. This account provides trading reference to members running the FSP cloner EA. Since this is a new service the trading history will build up over time. The strategies traded however, have live trading history since 2013. Since FSP clones trades from the Phibase Strategies, the following post will be relevant for live trading analysis. 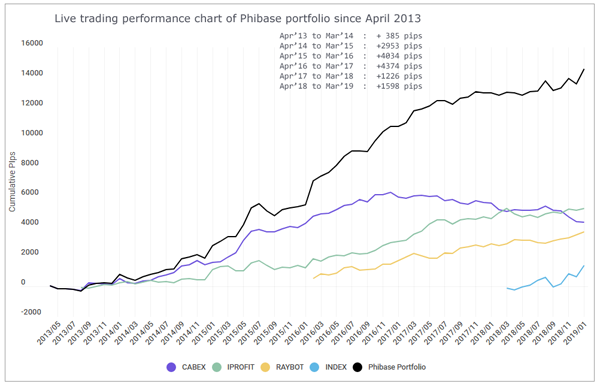 Phibase prefers analysis using Pips since it reflects the performance without effect of compounding results. Since none of our strategies use any kind of gird/martingale positioning, the pip charts are a true representation of performance. All our EAs are allowed to have only one open position per symbol at any point of time. One of the most common issues is trading differences across brokers leading to underperformance on the trader account. ForexSignalPort eliminates trading differences and assures 100% identical performance as seen on our reference accounts. Further, our innovative risk management module will filter our under-performing strategies and enhance the overall gains of the portfolio. Other advantages include lower strategy license costs, lower VPS system configuration requirements and ease of setup. ForexSignalPort enables us to shift the balance in your favour and ensures you profit from trading the Phibase portfolio. Monthly plans priced at $99. The subscription plans work out to about $59/month when billed annually. Monthly plans are only suitable for traders who wish to test the EA for shorter periods before committing for longer term plan. Our subscription plans are based on member feedback and requests to link fees with real performance. We hope members see this as a better alternative rather account size based fees which would be more difficult to implement with out collecting personal account size or trade size related data from the MT4. In the example below, we have assumed performance of a holy grail system to deliver +200 monthly. The real world trading results is plotted along side in this example. In the above example, under normal monthly subscription plan the trader would have to make 6 x $99 monthly payments irrespective of the gains. As per the Phibase performance guarantee assurance plan the trader is required to only renew subscription when equity is above the cumulative minimum guarantee assurance level, in this case : 3 x $99. This enables the trader to allow the strategy to work over and meet its potential. Performance history of the official reference account during your subscription period is used for accessing the minimum gain guarantee. 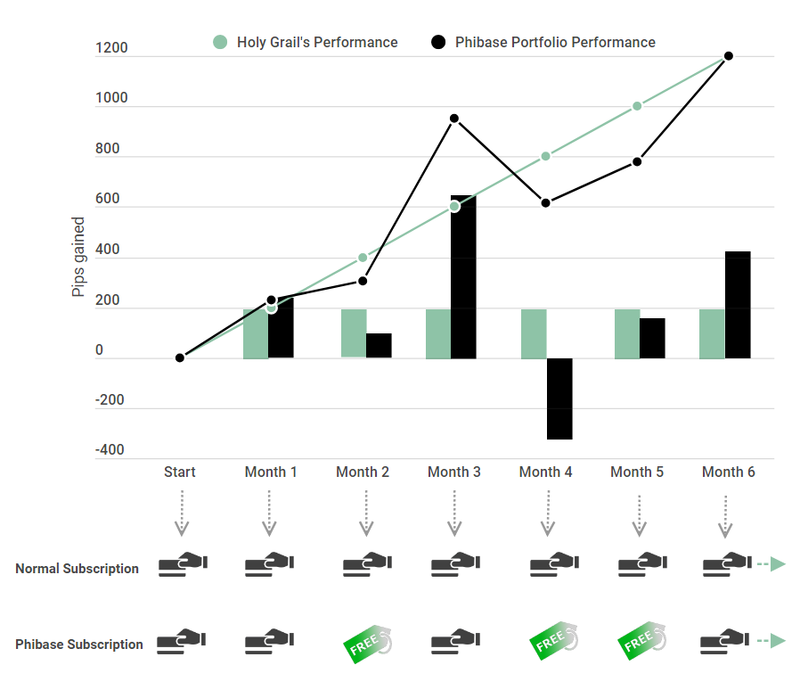 In this example, the subscription cost for trading seven month period is $396 instead of $693 (which would be the fee without the performance guarantee). The cost per month works out to $56/month. Of course, if the EA has a continuous win streaks of over 200 every month, the subscription fee would be $693 ($99/month). Similar performance guarantee assurance is available for quarterly (+600 pips), semi-annual (+1200 pips) and annual (+2400 pips). Performance on the reference account is used to calculate the gains during the trader's subscription period. This will ensure trader does not have to pay for any under-performing subscription periods and also enables the trader to run the strategy continuously to enable EA to recover from any stagnant/losing phases. Traders are advised to set Risk per trade parameter can be set as per their risk appetite, gain expectations and Max DD which will be enable them to handle losing phases comfortably. The portfolio drawdowns of about -1000 pips would be considered as deep drawdown - Max DD could dip to about -1300 if some SL hits (especially from INDEX) are seen during that levels - but these losses are recovered quickly. Lower end of estimated range would be seen if a deep drawdown was seen during the second half of the year since it reduces effect of compounding. Higher end of gain will be seen if no major drawdown occurred during the year. The above gain potential is based on gains of about +200 pips month compounded over the one year period (to provide similar effect Geometric lot sizing). The advice is based on risk/drawdown level at actual max and is basing gain potential on a minimum expected performance level. The average portfolio gains seen in live trading so far has been +210 pips per month. With addition of INDEX strategy, the potential annual gains is expected to average about +400 pips per month. If the average gain potential of +400 pips per month was used the annual gain potential ranges would more than double - with no increase in the drawdown levels. 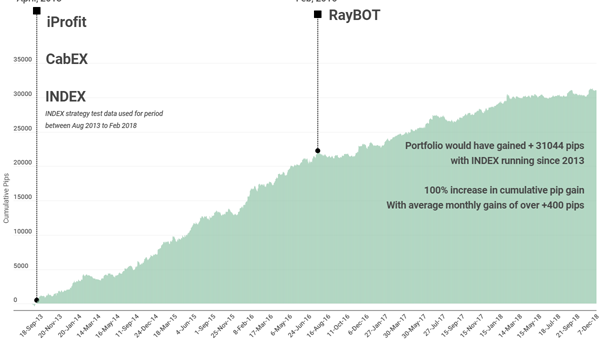 The below chart is based on contribution of INDEX trades to the portfolio (from strategy tests between Aug 2013 to Feb 2018). Typically, traders with smaller account sizes tend to use higher risk and traders with larger account sizes use lower risk. This varies depending on the goals of the trader. Annual Subscription Fee : $708 + VPS Cost : $240 = $948.